Through the greenway, neighborhoods will easily be connected hence creating a people-to-people connection. On March 2016, the City of Vancouver purchased 42 acres of land from Canadian Pacific Railway. This strip of land, called the Arbutus corridor, was a former railway. The Canadian Pacific Railway stopped using the Arbutus rail line in 2001, leaving the long stretch of land unused. The City’s intention was to create a linear transportation corridor, with the possibility of developing a streetcar track as well. However, the planning for the public space took a page from the idea of place-making. The City decided to openly reach out to the public for their opinions on the path, and use their considerations to help shape the future greenway. Several public workshops were held to discuss a temporary pathway as a short-term piece for the transportation corridor. At these workshops, stakeholders and members of the public shared their visions for the future greenway, and spoke on what they valued from public spaces. The City also collected public consultation surveys regarding the path. Stakeholders polled ranged from neighbors of the greenway to avid cyclists, elementary school students to handicapped pedestrians, avid environmentalists and business owners. But what did this diverse range of people want for the future greenway? One common element most individuals wanted was the dedication to preserving the ecology of the indigenous plants, species, and areas for non-motorized transportation. Community stakeholders wanted the balance between the quiet seclusion in nature and bustling neighborhoods upheld for the greenway trail. Another point that was universally agreed upon by stakeholders was the feeling of inclusivity. 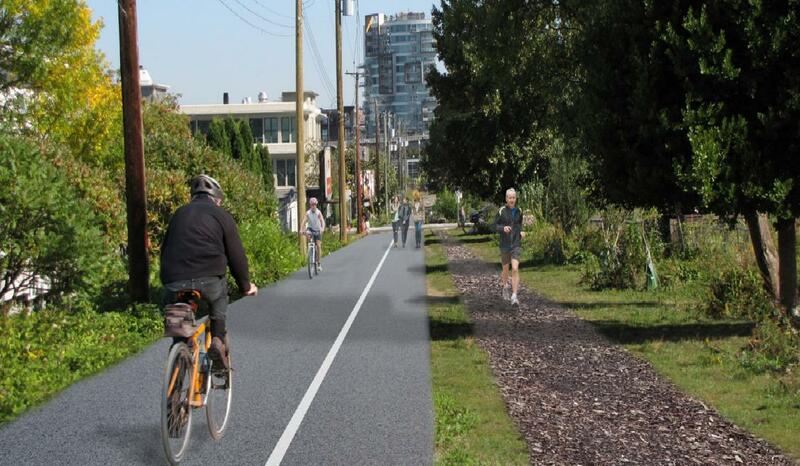 The Arbutus Greenway should represent and enable social interaction and inclusion for all. The site should be accessible by people of all ages and mobilities to gather and socialize within the community, while also promoting and offering the opportunity for healthy physical activity. As the overwhelming majority of participants who offered their opinions showed interest in the greenway being used for cycling, walking, and enjoying nature, opinions towards installing a streetcar were polarized. While some reacted positively to the idea, others expressed concern on having a motorized vehicle on the greenway. The slow shift of the corridor’s original design as a transportation corridor to a green trail mirrored the ambivalence of the public. These considerations shaped the Arbutus Greenway into a greener, more pedestrian- and community-based project. Residents supported the idea of seating being installed throughout the path, and another popular idea that began being implemented was the preservation of local street art and antique railway markers. In total, the City of Vancouver received 4,000 interactions from stakeholders, with 3,000 of these being in response to questionnaires. Armed with these suggestions and considerations, the resulting trail is a 5.6-mile road through the city. The road is marked with a line dividing pedestrians and cyclists, allowing both equal use to the path safely. Various areas where the Arbutus Greenway crosses streets have received minor improvements, along with multiple benches installed along the trail. A public art project was also installed with permission from the City of Vancouver. Grade 2 students at York House, an independent school for girls, engaged in a six-month art project under guidance from local artist Toni Latour. The students painted a multitude of rainbow-colored stones with several positive, inspiring, and environmental messages. The stones line a section of the greenway, with their messages concealed beneath them. This encourages passersby to turn the rocks over, revealing the various messages in the student’s handwriting. With additional final construction planned for late 2019, the Arbutus Greenway continues to exhibit success as a placemaking space. The City continues to improve surrounding landscape design, include further installations of public art, and encourage traffic calming at intersections crossing the Greenway. The Arbutus Greenway sees an increased volume of pedestrians and cyclists, thanks to a paved temporary path set until the City continues heavier construction in the future. There is even a bicycle-sharing station for individuals lacking bicycles. For now, the various neighborhoods are stitched together by this public site, which has taken this form due to community involvement. As more people use the path, more people become aware of the site’s future and purpose. The community’s increasing involvement in the planning and vision of the Arbutus Greenway, and its healthy revival are an example of how placemaking can make a difference for people in the community. Brad Done is the vice president at Reliance Foundry Co Ltd. He has more than 25 years’ experience in the manufacturing of commercial bike parking and other outdoor metal products.